yes, thanksgiving is still a long way from now but as i sit and enjoy the new love in my life, i can't help but feel blessed. so today, i'm going to give thanks to the many wonderful people in my life. on a good night, she will sleep 4 hours straight after one feed... on others, she will wake up every hour and 'demand' to be nursed. i have to produce at least 70ml of milk every two hours to satisfy this constantly hungry baby or allow her to latch on for 20 mins minimum or put up with her incredibly loud wailing. i can't understand how someone so small can be so loud? yet i get immense satisfaction knowing that she is thriving from whatever little milk i am giving her - indicated by the number of soiled diapers DH and i have to change every day (she's already using the 3rd pack of diapers we've got) and her weight gain. for that alone, i shall endure all the pain and soreness and persevere in breastfeeding her until she no longer wants to be breastfed. see what joy she is! 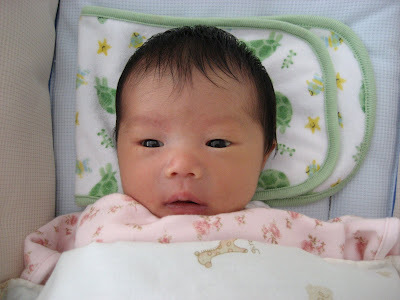 our little princess is 09 days old... :) isn't she just adorable? its almost a week since my dear princess made her grand entrance - my day/nights are now topsy turvy and for the next few months, i will NEVER have the opportunity to sleep my regular hours (10pm - 7am) again. yet, i can't complain; she's such a joy - i love it when she smiles, enjoy her blissful expression she finishes feeding and when she stares at me in the quiet of the night with her big, beautiful eyes. as per doctor's orders, we admitted ourselves to the hospital on the morning of 09/04/07 @ 7.30am, after each having a plate of bee hoon and nice, cold drink @ the foodcourt on level one. on admission, i was immediately strapped onto the CTG machine to monitor princess' heart beat and my contractions. dr. appeared @ 9.30am (he was supposed to appear @ 8 plus!!) and seeing that i was only 1cm dilated, he made arrangements to induce me with pitocin, after breaking my water bag. in another 2 days, i'll be 40 weeks pregnant... obviously, its good that i've reach full term without any hiccups so far but i'm also getting worried. dr tan is not about to let me wait out for natural birth to happen. he deems it is 'medically necessary' to induce me this thursday because i have lost 1.2kg in the last two weeks and he's concern that its either because 1) the placenta is not working well or 2) the amount of amniotic fluid has decreased. this is despite a normal CTG done today @ his clinic and princess putting on another 1+kg bringing her estimated weight now to 3.2kg. sigh... i've been hoping for a TOTALLY drug free birth and its becoming seemingly impossible now. i will have to return to the clinic on wednesday to do another CTG in order to delay induction to next monday. princess claire, you have TWO days to make your grand entrance so please... be a good gal!